In a near future scenario where humanity has a slightly more developed/active space flight. Think colonising the moon with regular space flights back and forth. But no fancy interstellar tech. Otherlings show up from a distant celestial body and proceeds to block out the sun, hoping to get something in return. Humanity does not have this something, and will not have access to sunlight after the blackmail has been innitiated. The otherlings have about as advanced space technology as humanity but more resources devoted to it. What distance from the earth would it make the most sense to erect this sun blockade? And to a lesser extent how would it block the sun, if it's not sensible with a giant space blanket at that distance How big would a satellite need to be to block out the sun? What distance from the earth would it make the most sense to erect this sun blockade? Answer: at the Sol-Earth L1 point. In celestial mechanics, the Lagrangian points (/ləˈɡrɑːndʒiən/ also Lagrange points1, L-points, or libration points) are positions in an orbital configuration of two large bodies, wherein a small object, affected only by the gravitational forces from the two larger objects, will maintain its position relative to them. 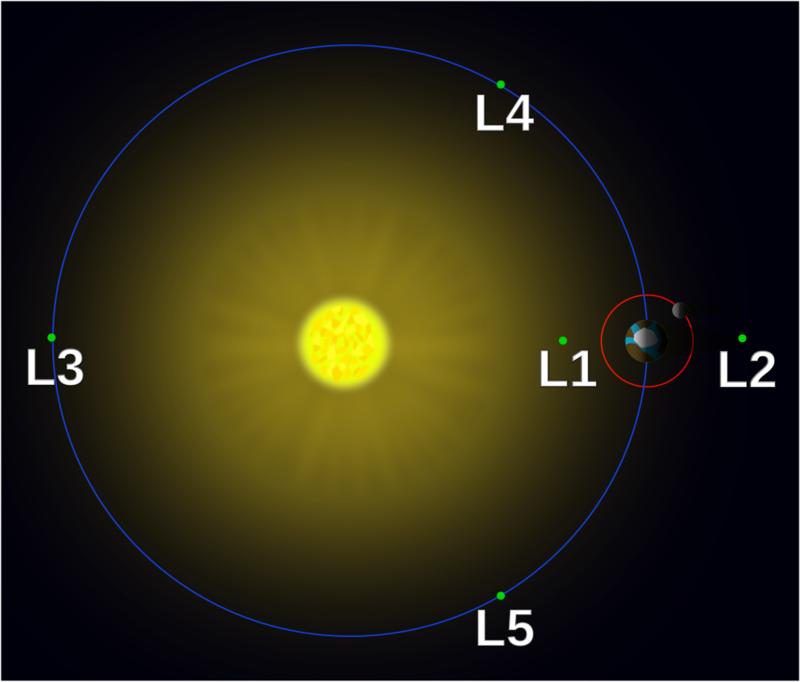 Lagrange points are ideal for parking an object that needs to remain "stationary" in relation to the Earth and the Sun together. The Sol-Earth L1 point is at 0.01 au from the Earth, that is to say 1/100th the distance from the Earth to the Sun. Greenhouse gasses have — since the 1750's until today — caused an increase in "radiative forcing" by about 2.86 W per square meter. This tiny little increase is what the entire climate change brouhaha is all about. This means that a change of about 0.2% of solar irradiation is causing us a big headache today. Let us say that these aliens plan to hit us for about 10 times that amount. They aim for a 2% decrease in solar irradiance. At 1/100 the distance to the Sun, the "fuzziness" at the edge of the shadow can be pretty much neglected. So we need something that covers the equivalent of 2% of the Earth's silhouette. The silhouette area for a globe scales with the square of the radius, or conversely: the radius of a circle squares with the square root of its area. So to downscale a circle to of 2% of the original area, you need a diameter that is the square root of 0.02, that is to say 0.14, or 14% of the Earth's diameter. The Earth's diameter is 12,732 km, and so this "alien Sun shade" needs to be 1,800 km across to shut out 2% of the Sun's light and thus threaten us with a global ice age. How likely is this caper to be discovered? The Sol-Earth-L1 point is highly interesting for humans to park things at. Not that we ourselves are likely to be buzzing about there, but remote sensing satellites are already today orbiting L1. This may provide you as the author with some plot hooks that let your human protagonists suspect something foul is afoot when satellites go offline or start transmitting very weird observations. Yeah, that is how we solved the global warming problem: we made ourselves a controllable Sun shade that lets us filter sunlight in various ways to control the climate in a very precise manner. We can change the colour and content of the light depending on how the Sun shade filters the light. Especially interesting to us is to keep the UV light down, since UV is high risk factor for skin cancer. And why engineer something when we can over-engineer it? So it has the size that is needed. But too bad that we did not also engineer a way to lock out nasty aliens that hijack the control center and start messing with it. In fact, those that sneered at the notion that we need a way to prevent nasties from messing with it... 'boy were they proven wrong when it started snowing in the Sahara! Goal: Block all sunlight to Earth. In order to shroud Earth into darkness, you'd need something slightly bigger than ~12.500km in diameter with a round shape if you'd put it on the edge of the Earth. If you'd place it exactly in between the Earth and Sun, it's the diameter of (Sun - Earth) * 0.5 + diameter of Earth, which is ~700.000km. If you'd place it on the Sun, it would be the diameter of the Sun. If you'd place it on 20% of the distance from Earth to Sun, it would be (Diameter Sun - Diameter Earth) * 0.2 + Diameter Earth. So it's at least the diameter of Earth and has to grow in diameter as it approaches the sun. It depends on you where you want it to be, but I would suggest... keep it as close as possible, unless your aliens are really resourceful. The further you went away from the earth and closer to the sun, the surface your satellite needs to cover goes up, until the visible surface of the sun itself. This would be over 5000 years of Earths production of aluminium. Not that it is just heavy to lift up from any gravity well, you need to keep it in place. Even with the Lagrage-Points L_1 and L_2, whice are unstable, you still need correction burns, and that against an object with that high amount of mass. And, to destroy it simply send something up to ram it. The thinner the shield, the easier it gets destroyed. Also, sending something so big into space could be detected very soon. Asteriods get tracked with radio and other telescopes. If you had one big satellite, that sends and recieves radio signals and reflects light, it would be easy to detect and conclude, that it must be alien (or otherlings). So, with similar technologies, it is almost impossible to do. Instead of one collosal satellite, the otherlings could build several smaller satellites with sun covers. If you want total coverage, you will still need the size and thus amount of material for the sun covers. Benefits would be, you have several small objects, that are easier to handle and to steer, keeping them in a specific orbit would be easier. Also, destroying them would be far more challenging. Even a bigger explosion would only take out some of the satellites, as you could space them for a short time and send them back into the position they should be, then replace the missing ones. Additionally, you could build them one after another, sending them over a long period of time. Then, if you have them in place, spread the sun covers. They still would send out radio signals, but much smaller than the collosal one, it would be harder to detect them, but not impossible. As stated in your linked question, even reducing the amount of light by 1% would need a really big surface to block. If you had only a few satellites to block the sun, you could organize them to block the light from some important places. Rural centers like the american coasts, central europe and china would increase the amount of energy needed in those areas. If its a energy starving world as ours, this could lead to devestating conflicts. Blocking sunlight in areas of food production, plant cultivating and so on would lead to massive starvation. Not the answer you're looking for? Browse other questions tagged space aliens spaceships near-future or ask your own question. Why would a civilization want to contact with a hypothetical extraterrestrial civilization? Can we expect machines as extraterrestrial forms of life? Is there a Dyson-like megastructure that would not block out the sun? Exploring extraterrestrial oceans with submarines? How does an extraterrestrial spacecraft survive a nuclear explosion directly impacting it in LEO? How would extraterrestrial diseases not infect other extraterrestrials/us? How to compromise block chain force shield?